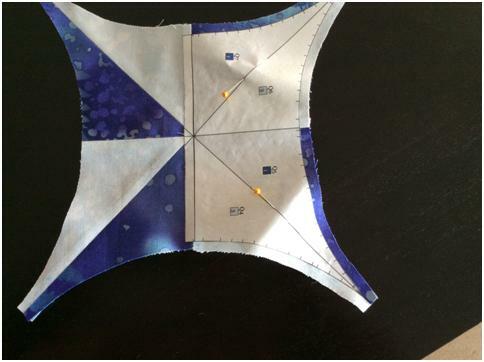 Revised instructions for the chakra block have been uploaded on the main blogpost, as there was an error in the fabric coding n the previous file. The templates remain the same. Please download and print the revised istructions – also downloadable here. Please do not cut fabric for Chakra till I give the go ahead. There are some errors in the fabric coding. Furthermore, with a heavy heart, I have to inform you that I have decided not to post any more blocks for the BOM after Block 12, as I have not been getting any testers.Small typos and errors can create problems for those following the BOM…I do not wish to be responsible, any longer, for the fabric wastage and more importantly, heartbreak! I hope everyone will understand! I have revised the Instructions File for this Block on 26th January 2015. Please print the fresh instructions if downloaded before that date. This block has to be my absolute favourite. For one, it is a tribute to my country, India, on our Republic Day falling on 26th January. Secondly, it is designed by me, not based on any other quilt block that I have seen. The Ashok Chakra, which is the inspiration for this block, is at the centre of India’s national flag. It is taken from the edicts of the great emperor Ashok, who ruled over almost the entire sub- continent, in the third century B.C. 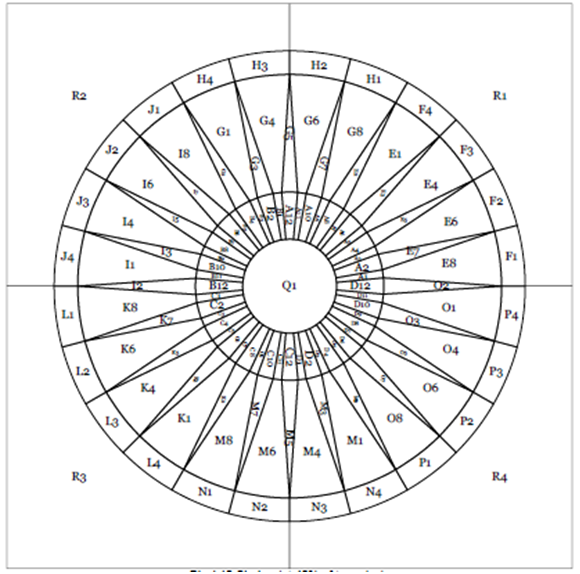 I quote from Wikipedia : The “Ashoka Chakra” … is the wheel of the law of dharma. Truth or satya, dharma or virtue ought to be the controlling principle of those who work under this flag. Again, the wheel denotes motion. There is death in stagnation. There is life in movement. India should no more resist change, it must move and go forward. The wheel represents the dynamism of a peaceful change. The links for Instructions and Templates for this pattern are given at the end of this post. For the other block patterns, please go here. As mentioned above, the block finishes at 18″ square with a 15″ inset circle. I have used four shades of blue (coded 1, 6, 5, 4 from light to dark) and four contrasting colours ranging from yellow to orange ( coded 2, 8, 7 and 3 ) for the block in the Dusk colourway. **Rectangle 4″x 6″ for six circles 1.5″ diam. Please note that I revised the pattern template `naming’ after piecing my block. Don’t let the piece numbering on the pictures confuse you. Print first two pages of the Instructions File for ready reference. Print Paper piecing templates file at 100% (or actual size ) in portrait mode and cut out the templates. 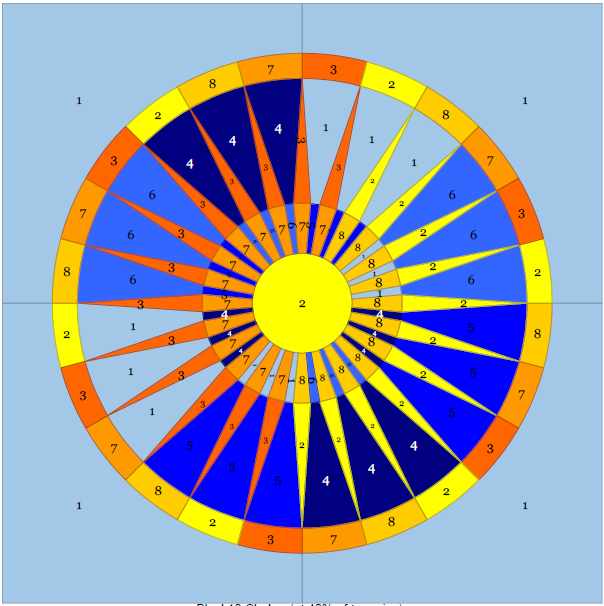 You can decide if you wish to use the **circle templates and print the file as and when you need it. . 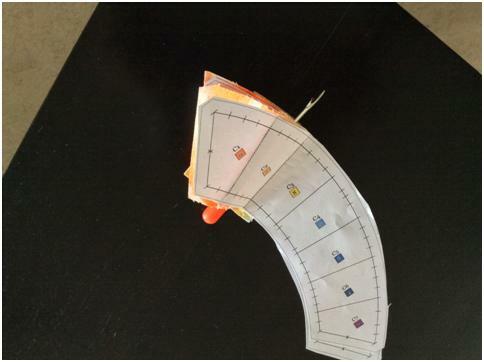 I printed the 1″ circle templates on freezer paper. If you are interested in English paper piecing or regular piecing for this block, I have also provided the option of individual templates in a separate file. 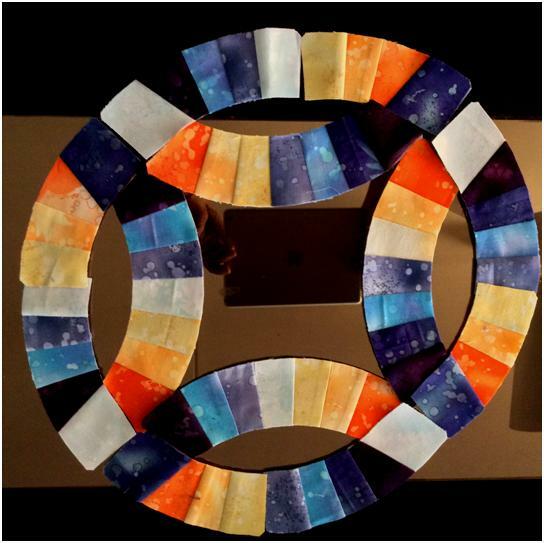 Piece the inner ring templates A,B, C and D.
Make piles of the rectangles for the inner ring – all four shades of blue and two shades of the contrast fabric (light orange and gold) are used here. Reduce the stitch length on your sewing machine, so that the paper can be torn off easily once you are done. 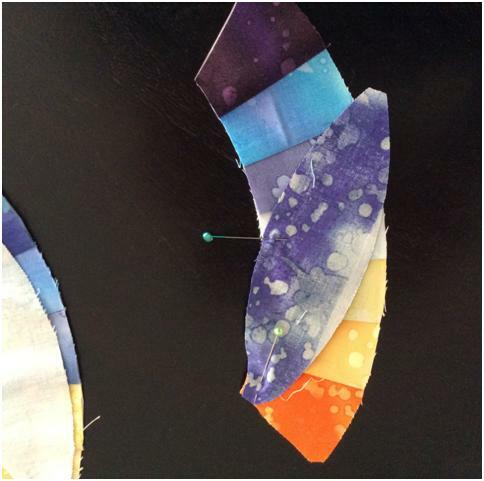 The strips in the inner ring are ready at less than a ¼”. 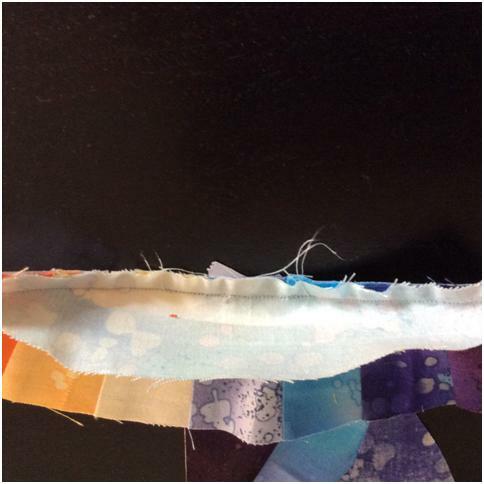 Fold the paper on the incoming seam and trim the seam allowance to slightly less than ¼”, before you join the next strip. 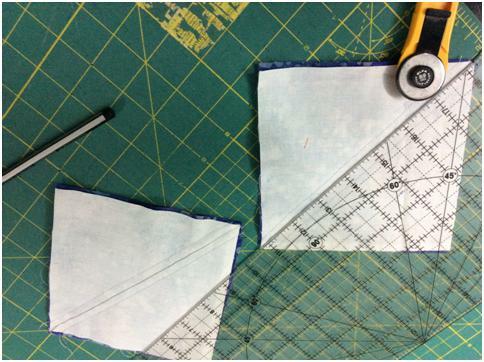 Fold the paper template away on next seamline and trim the seam allowance to 1/4″ before sewing the next piece. Piece the middle ring templates E, G. I. K. M. and O. Here, we will use the other two shades of the contrast fabric (deep orange and yellow) with the four shades of blue. Again, trim the seams before you join the next rectangle. Piece the outer ring templates F, H, J, L, N and P. It is possible to chain strip piece these, which is what I did. I used strips to chain piece the outer ring. It is as easy to use rectangles. 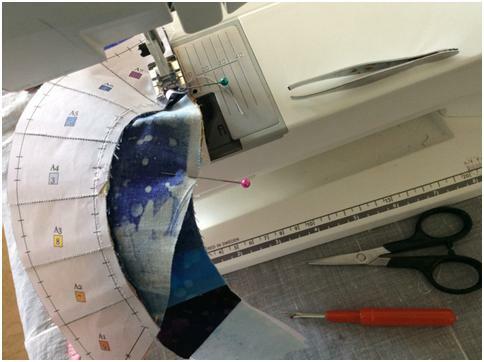 Prepare the twenty four 1″ circles for appliqué. I must be a glutton for punishment, as I prepared the circles using the pulled thread method and appliquéd them by hand! Cutting 6 circles at one go using freezer paper templates. Cutting twenty four 1″ freezer paper circles using the Circle templates… the most tedious part of this bock! Iron the paper circles at centre of the fabric circles. 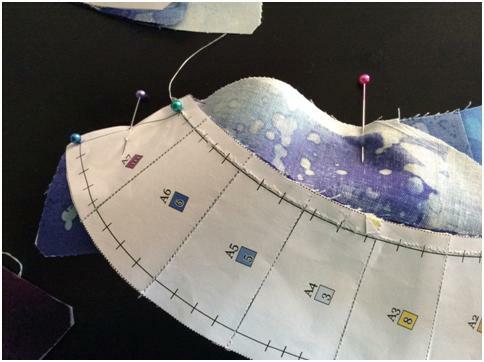 The ‘pulled thread” method for preparing the circles for applique. Note the long ‘tail’ on both ends of the running stitch. Applique the circles to outer edge of pieced wedges F, H, J, L, N and P referring to the colour design. Note only half the circle is visible in the finished piece. Tack the circle to the edge of the corresponding template piece, such that the midpoint of the circle falls on the centre of the seam line at the outer edge of the piece. About ¼’ of the circle will stick out and beyond the template. Applique it in place using an invisible stitch. Tack the circles on the middle ring (in correct order!) matching the centre of circle to seam line. I love to hand appliqué so I really enjoyed my afternoon doing this step! You could possibly machine appliqué the circles, if you are confident about getting such a small circle right by machine. 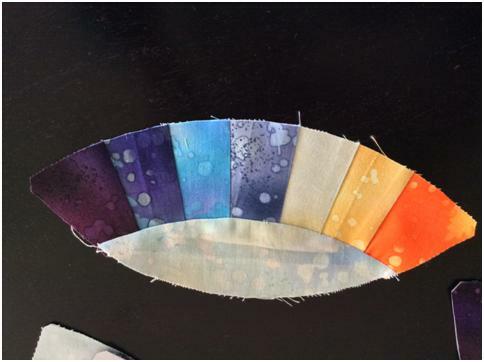 You could also fuse one inch fabric circles in place if you have access to double sided fusing like Heat ‘n Bond (Red) or equivalent. Or you could even omit the half circles altogether! Arrange everything in order of assembly and gloat!!! Refer to the Master Template given here to assemble the block. Note it is a mirror image, and shows the block as it would look from the printed paper side. 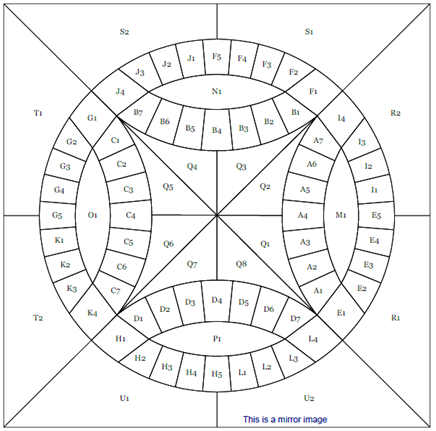 Join E to F; G to H, I to J, K to L, M to N and O to P. ( The half circle should match the colour of the adjoining outer ring piece). I experimented with several methods to see what works best. The last method was the easiest and worked best! First, I trimmed the seam allowance on the paper templates F, H, J, L N and P. I left the half circle on corresponding untrimmed and pinned the first pair at every possible point! (Do not attempt this, it added no value). That paper is not necessary – remove it! The paper kept getting in the way, so I removed it for the next pair. The pinning was the same and the circles were left intact. 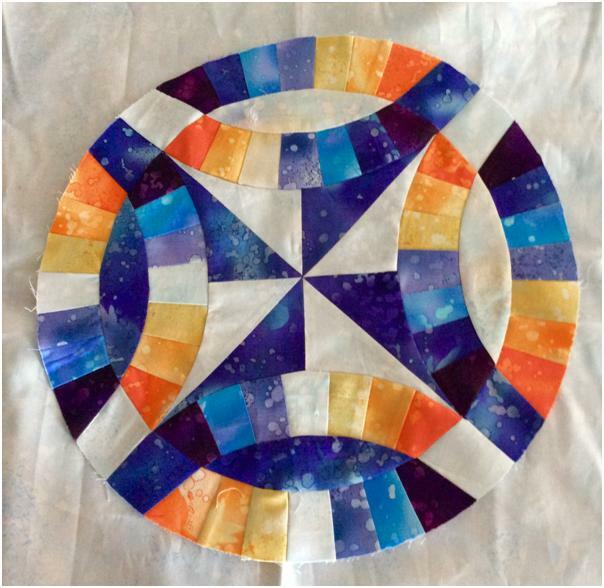 The circles got in the way of aligning the edges of the pieced templates – not recommended. 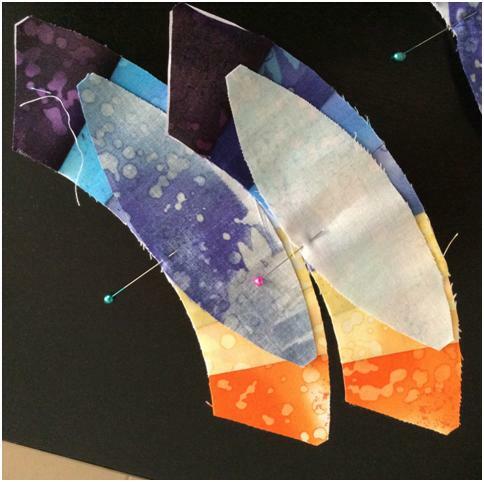 Those circle bits sticking out – trim them, BEFORE you join the two templates. Trim the circles like this! …pinned and sewed another pair together. Even so much pinning is not necessary. 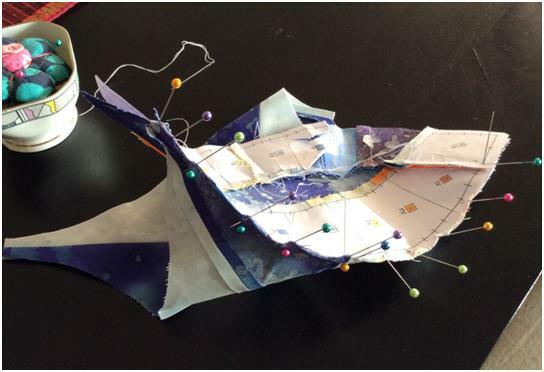 Keep only the pins to match the corners and one each at the seams. Finally, I used just 5 pins, one each on the corners and three to match the seams. The seams abut against each other and join beautifully, without any additional pins. That is the one I did not take a picture of :-p. This gave me the smoothest curve! And this is what I recommend – trim the circles to the template edge, remove paper from outer ring templates and pin minimally. The next step is to join the outer six wedges in threes. Before you do that, remove the extra paper on the seam allowance and press the seam outward. Pin at corners and at centre. Three pins to have everything aligned. Note the paper removed from the seam at the `skirting’? Next, join the innermost pieced rings in pairs. 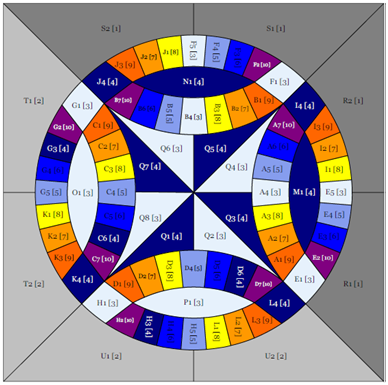 The inner ring templates are joined in pairs while the outer in threes. 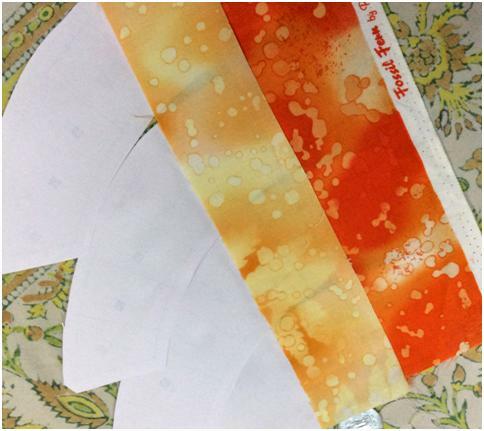 Remove as much of the paper as you can – on at least alternate pieces. This was surprisingly quick and did not need any pinning, as the seams worked as alignment markers. Join the two circle halves. Just one more seam and the circle is done, barring the centre piece. Yes, I can see a couple of unmatched seams and plan to re-do those when I do the last steps, that is, firstly appliqueing the circle to the background and then finally to applique the centre circle Q1 (3″ diameter ready). You can download the Instructions and the Template files from here. You would need Adobe Reader ( free online download available) on your computer to be able to open these files. 4. 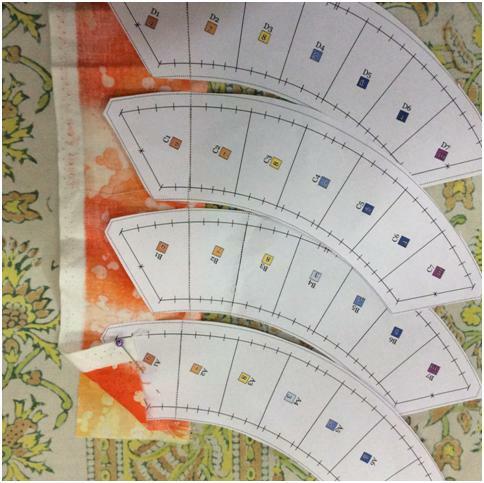 Optional Templates for EPP/ regular piecing. 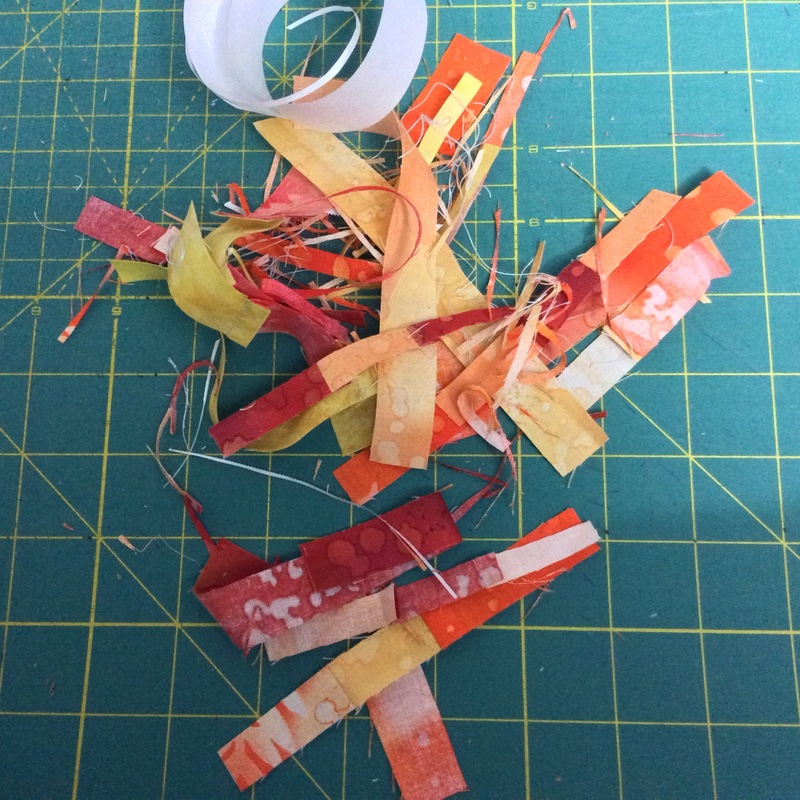 What is the minimum size of scraps you save? Block Ten is ready for assembly and Block Twelve is on its way. I am undecided about Block Eleven. And I am still looking for block testers! How is everybody else doing on their Round the Year quilts? Have you not always wanted to make a double wedding ring block? A whole quilt would be too much, but just one block? We have a comparatively complicated block lined up for the next fortnight and many of us have a few pending blocks to catch up with. Plus, I celebrate my 33rd wedding anniversary this January – that clinched it for me! A wedding ring block it is, to start 2015! You may like to see how I used this block to make a wedding anniversary gift for my sister-in-law a couple of years ago. 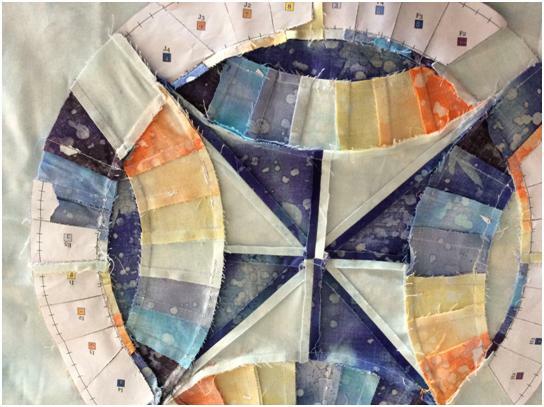 This 18″ block, with a 15″ paper pieced wedding ring, is the ninth of the Round the Year Block of the Month quilt, which began mid July 2014. Click the link at the end of this post for templates and instructions (including fabric requirements) in downloadable .pdf format. I have used 5 shades in the blue- violet spectrum and 3 shades in the yellow-orange range to piece this block. The background is in two shades of grey. Take print outs of the 3 files Instructions, Templates1 and Templates2 with printer settings at 100% or actual size in portrait mode. I printed Templates.2 file on freezer paper for ease and accuracy in cutting fabric. Templates R1 and R2 for background. 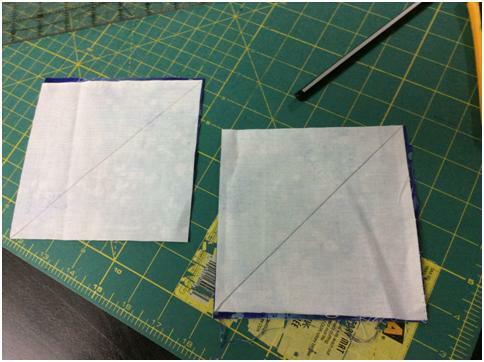 You need to glue at edge as indicated in template – cut 2 each from fabrics #1 and #2. I am not joining the pieced circles to background right now; I shall do them all together. For this particular block, I recommend assembling the entire circle and the attaching it to the background. Template Q in two parts – glue at edge indicated to make into one template. 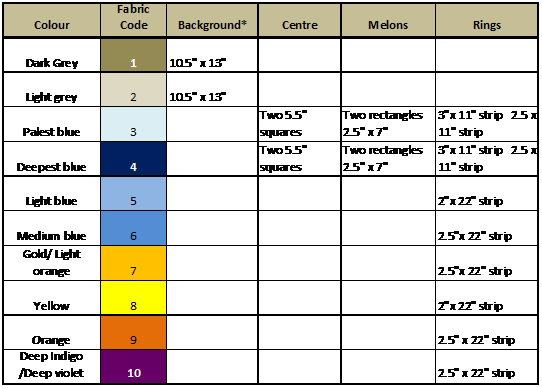 Please refer to this Master Template as a guide for piecing and assembly. Remember, it is a mirror image, and shows the block from the reverse, printed paper side! Master Template – Wedding Ring Block. This is a mirror image! It is easy to chain strip piece the ring templates A, B, C, D. Detailed instructions for this technique of foundation paper piecing are given with the Block One, Dahlia pattern! Chain strip piecing. Have you reduced the stitch length? 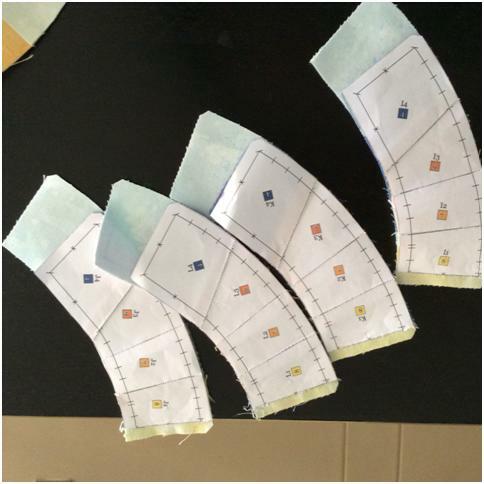 Strip for A1, B1, C1, D1 ( Fabric #9 here) will be placed, wrong side touching paper on unprinted side. Incoming strip, for A2, B2, C2, D2 ( Fabric #7 here) will be placed right sides together with previous strip. 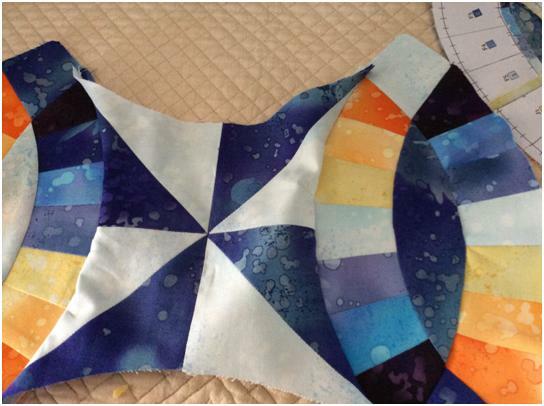 Keep sufficient space between templates when chain piecing. Cut apart the templates before attaching next strip. Press open the strip before you cut apart the templates! Press open incoming strip before cutting templates apart. And remember, what not to do! Two templates stitched as one! Jack (the Ripper) had to intervene! … and arrange them all together and admire them! The rings are pieced, Stand back and admire! 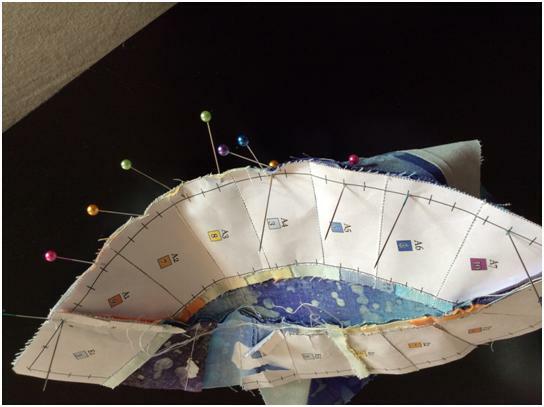 Sew together the outer ring templates in pairs. Now to attach the melons M, N, O and P to the pieced inner rings A, B, C and D respectively. 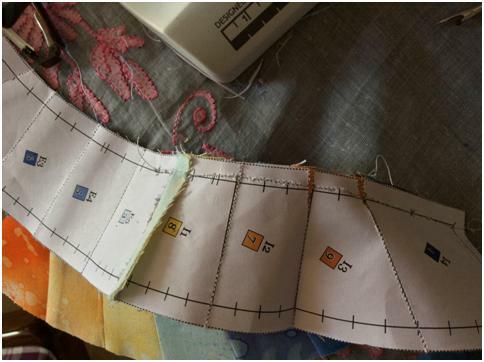 First, I trimmed the pieced templates carefully on the dotted line for an accurate ¼” seam allowance! I used a couple of pins to align the melon to the ring. I folded the melons into half to find the centre and pinned them, seam to seam at centre of piece #4 on the templates – A4, B4, C4 and D4. I then matched the blunt edges at the corner where I would begin my seam line, and secured them with another pin. Secure the start corner. The end corner remains free. 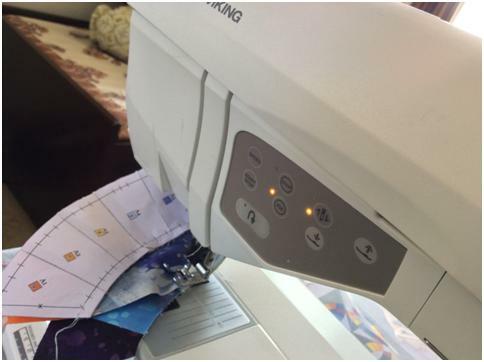 I chose the 1/4″ stitch option on my Hasina Husqavarna Viking machine, reduced the speed to a minimum and gently eased the melon curve to sew it to the template, moving 2-3 stitches at a time. Melon attached to inner ring. Press down seam. I pressed the seam towards the melon. My seam is a little uneven, but this does not bother me. The best thing I like about curves is that they just fall into place if you press them down gently! The next step involves attaching the inner ring to the melon. Is this going to get a bit more challenging? Referring to the Master Template, I attached EI to AM; FJ to BN, GK to CO and HL to DP. 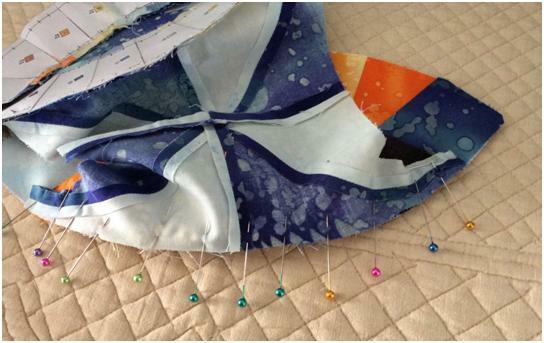 Attaching melon to outer ring : Align and pin on seam line. After aligning the two pieces at the centre – melon to outer ring template, I used vertical pins to align the corners at the edge of the rings ( A7 to I4 in this instance). I then secured them with a pin in the centre. You will notice that I pinned only at the corner at which I started the seam, not at the end. I find that a pair of tweezers helps in keeping everything in place. Tweezers, ripper and scissors on call. Not visble – pin cushion! Fix thread and needle down. Speed minimum, stitch length 1.5. Oops! Something moved – needs re-doing! Perhaps it would be better to keep the ring template on top, to get a perfect seam? I finished the four melons and pressed seams inwards, towards the melon. This was surprisingly easy and done in less than 15 minutes, pinning and all! 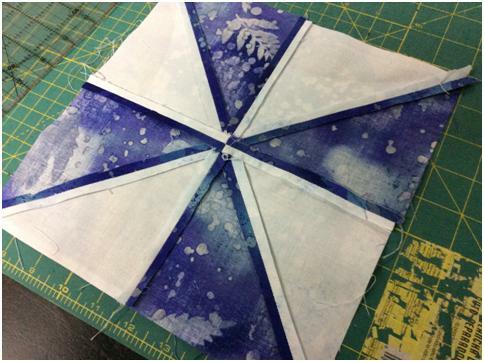 To move to the centre now – I first made a pinwheel using the two 5.5″ squares each of Fabric # 3 and Fabric #4. I used the easiest way of making the pinwheel. I paired the light squares with the dark and drew a line on one diagonal on each top light square. 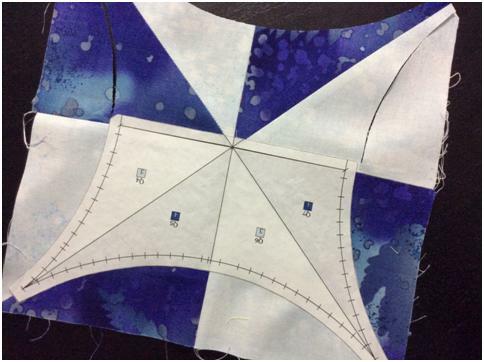 I sewed a ¼” seam on either side of the diagonal and then cut along the centre pencil line. I now had four HST (half square triangle) squares. I usually press the seams to the darker side, but here I chose to press them open. 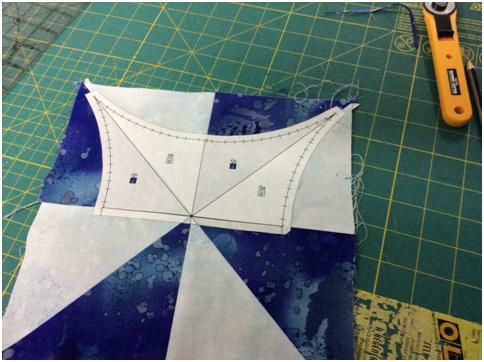 I then joined the four squares to make a pinwheel; pressed open the seams again, to reduce bulk. Seams pressed open; the 4 squares joined together. The patch in this picture is pieced WRONG! The dark patches should be where the light ones are! Perfect? No! As it turns out, I joined this wrong; the dark patches should be where the light ones are and vice versa. You may think this does not matter, but it does, in my colour scheme! You will soon know why! …and the other. The centre was fast work too! Alternatively you can cut HSTs from the squares and paper piece the centre. I now trimmed the freezer paper template to the seam line and pressed it in place, on the right side of the pieced centre. The markings on the template helped me align the centre to the melons. Centre done! Trim template to seam line to help pinning on alignment markers. I first joined the melons on opposite sides of centre Q.
I then attached horizontal pins on the seam as shown, removing the vertical pins as I went along. Pins stuck in this way are easy to pull out and unlikely to prick your hands. I removed the template before I sewed the two patches together. I then pinned the template on the opposite side. Upto this step, everything went off unexpectedly quickly, other than that small encounter with the ripper! Now things started getting a bit tricky . Worth all the pinning? Opposite melons attached. I had read on a blog somewhere, that you should not press your block at this stage, but I don’t think that works for me! I suggest you DO iron the seams towards the centre pinwheel, before you move to melons #3 and #4. And don’t spare those pins! Especially at the corner, where the centre meets the melon. Join the melon in one smooth curve. My corners did not match on Lemon #3 and I had to do a bit of ripping at this stage, because I had not pressed the patch and I had not pinned enough. I could appreciate why this block is traditionally hand pieced; I was sorely tempted to do this step by hand to set those offending corners just right! These few hiccups apart, this was a simple block to make – I could finish it in an afternoon. One last thing – the seams! Press the seams on Lemon#3 and Lemon#4 outward – towards the edge of the circle! Press last two seams towards edge. Voila! We are done with Block Nine! Now to come back to the little matter of the clockwise pinwheel. Can you see that the dark triangle on the pinwheel is touching the dark (blue) side of the inner ring? Would it not have been prettier to have the yellow-orange contrast against the dark blue, like in the original design? Before I upload the Instructions and Template Files, one more thing! Many of you have asked me for a mirror image of the block in colour to help in assembling the block – I do not know how useful that can be – but here it is! You can download the free pattern and instructions from these links. You would need Adobe Reader (software available online for free download) on your computer to be able to view these files. Instructions Block 9 Wedding Ring, Round the Year Quilt. Templates.1 Block 9 Wedding Ring Round the Year Quilt. Have a wonderful year ahead! Happy quilting!